The thought of planning a funeral for Leo terrified me from the moment I realised we were going to have to have a funeral. What on earth does a baby funeral look like? It’s hardly something you spend years collecting inspiration for on Pinterest, I remember remarking to my sister whilst walking around a cemetery trying to suss it all out. I didn’t know where to begin. 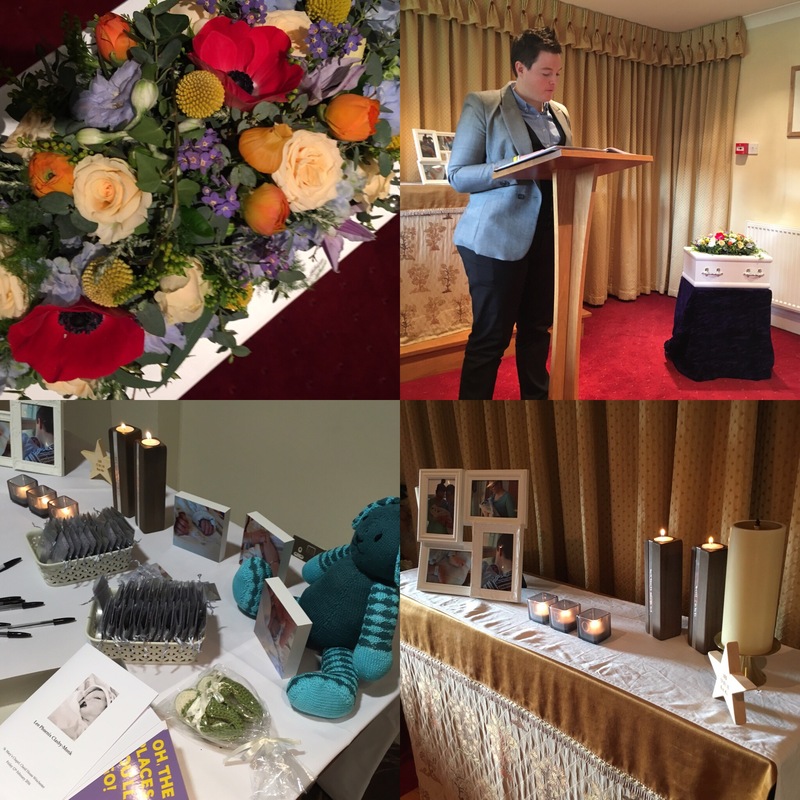 So I’m writing this blog as an attempt to first, remember the day and second, maybe help even one family trying to see through the darkness of planning a baby funeral. I have always thought that if you doubt something, it’s instinctively the wrong thing to do. The thought of burying my baby made me feel physically sick, but the thought of cremating him was worse. So burial it was. It was the lesser of two unthinkable things. The information also told us that you can be left with very little ashes, and something about that seemed so sad to me. Before we had looked into it at all, we instinctively knew we wanted to bury Leo close to our families. Being a military family, we didn’t have a place where we would always stay in the future but with both families from the same city it seemed logical to make sure he was close by to a regularly visited place. Being quite adamantly non-religious a church funeral or churchyard didn’t seem right. 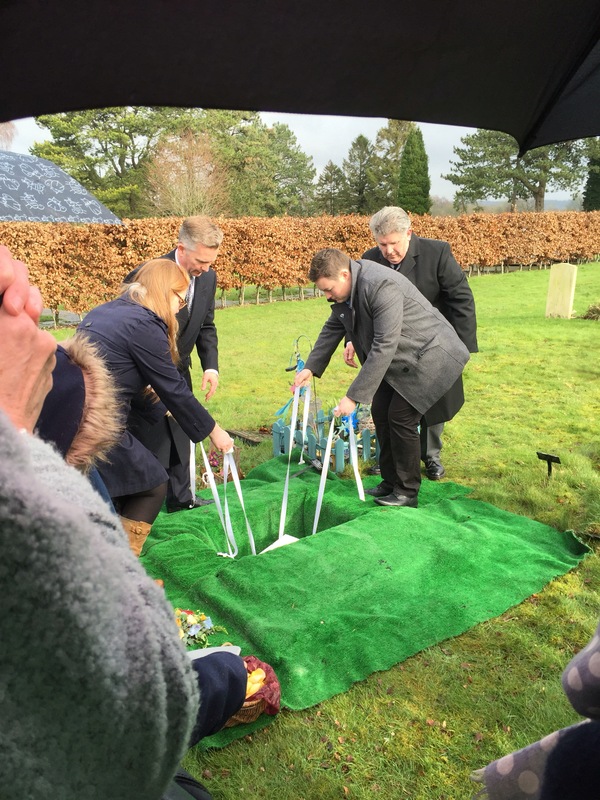 So, when we came home after the hospital we visited a local council cemetery that we had presumed we’d bury him in – the amount of choice isn’t great. But the realisation that I was going to have to bury my baby hit me, hard, and I didn’t react well at all. It was raining, the place seemed so disorganised, and I panicked that we’d loose him. Granted, we didn’t find the baby section and I’m sure you’d never loose them but the place seemed so big for someone so little. Coupled with it being a walk through for the local hospital, it just didn’t sit well with us. At all. We had a few kindly offered suggestions of alternatives, such as a woodland burial. But again, it just didn’t seem possible for us. What we quickly realised, by having alternatives at least we discovered what we weren’t capable of doing and that enabled us to feel safer with the options that didn’t appear so horrifying. My sister ended up taking us to a cemetery where her husband’s family are, and whilst it’s 15 minutes on the motorway, it was the safest option and felt poetic. It was in the same city we had our civil partnership and later marriage conversion, and next door to our wedding venue. As my sister said, it’s part of your journey. The location led to us being recommended a funeral directors. We had rung round a few others and again, discovering what makes you feel uncomfortable helps you feel safe with those that do make you feel comfortable – a reminder that you are doing the right thing. They were brilliant, respectful, practical and completely accommodating. They also recommended a wonderful Humanist who, in very little time, understood us and Leo enough to write a beautiful ceremony for him. The Directors took Leo into their care without delay and we got to see him twice whilst he was there. His coffin just seemed so small. That was quite a shock. Whilst I have no regrets at seeing him there, it was very different to having him at the hospital. He looked different (not in a bad way), just different and we couldn’t hold him. I needed to see him, to know he was safe and looked after, but I didn’t want to spend too much time there – I wanted to protect our earlier memories. We eventually discovered that you can actually have Pinterest baby funeral boards – there are a lot of ideas there and on Google in general. I discovered a blog by someone who recorded details of her baby funeral, and it gave me hope that you could own the day by putting your own special touches on it. It didn’t have to look like a funeral – which was my biggest fear. Having never gone to a burial and only to a few funerals, the image in my head was very black, dark and mournful. And that just didn’t seem right. Music – we picked three tracks, Nimrod (a marker of rememberance day celebrations); Stand By Me by Ben E King (the music I walked down the aisle too, that played just before egg transfer and became our and Leo’s song) and lastly Grow Old with Me by Tom Odell (one of N’s favourite sad songs now with dual meaning). We realised that the music we chose would forever be associated to his funeral, so considered these safe options as they were linked to him or feelings of sadness already. Readings – we both wrote Leo a letter in the hospital to say one of our many goodbyes, and decided to read these at the funeral, to share what Leo meant to us. We also asked my sister to read Oh, The Places You’ll Go by Dr Seuss – we had been working our way through the box set, reading them before bed and this was our favourite. It’s full of life’s lessons, that Leo would have encountered and, whilst long, seemed fitting. As she said, she was honoured to read him his bedtime story. We also asked our best friend, my bridesmaid, to read a poem we found online – Little Snowdrop, which was lovely and very poignant. 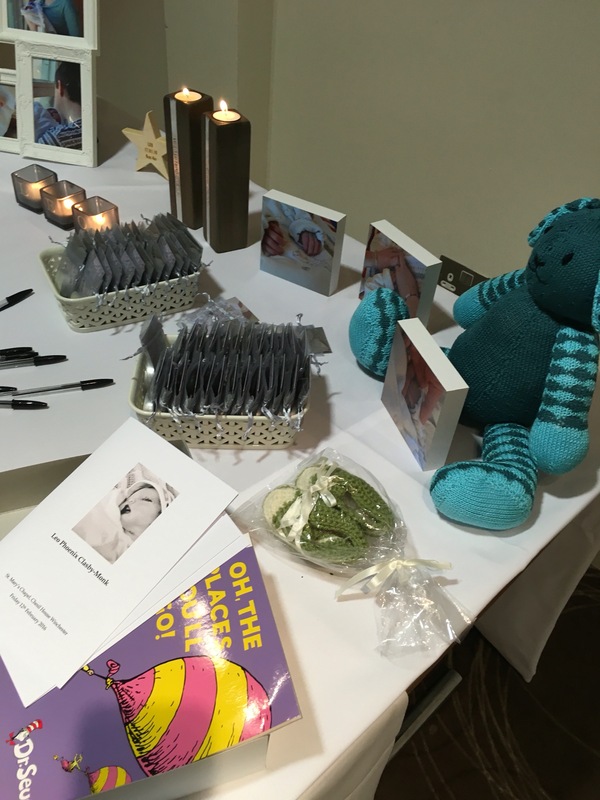 Pictures & Candles – we took a collection of Leo’s things to display at the service and the gathering afterwards, his candles, pictures and nic-nacks. We felt this gave him a sense of person, and allowed those who hadn’t met him to understand the realness of him. His tiny coffin was displayed as well, he looked beautiful with his flowers – from one of my favourite florists, who arranged my bouquet for our marriage conversion. At the cemetery, it rained. Typical. I had been checking the forecast all week, willing it not too, but it was okay in the end. It was a short service and I wasn’t sure what to expect, having never gone to one before. Our funeral director clearly gauged that we were coping well, considering, and encouraged us to carry Leo from the car and to also lower him in when the time came. Both options had been briefly discussed before and I and my wife felt that we would rather the professionals do both (visuals of me tripping over and all sorts came to mind! ), but they gently encouraged us to do it, and I’m so pleased we had the opportunity too. It really wasn’t as scary as it seemed. We read three poems, Winnie the Pooh, a poem N’s mum had written and a poem that I had too, Oh, my Little Leo. We then offered out a basket of yellow rose petals for everyone to throw into his grave. beautiful and peaceful. It felt peaceful and comforting that he was finally in his resting place, and that now, we’d know he would always be safe. We held an informal reception afterwards in the same room that we got married in. When we first considered it, we did think that maybe it would taint memories of our wedding but in truth, it felt right to have those memories and memories of Leo combined. We placed out his photos and candles, and passed round a book that we had engraved with his name for people to write in. We chatted and caught up with friends, drank, and spoke about Leo. Afterwards, me and N went for a walk on our own to just digest it all. It was a day that we never thought we’d ever have to do, but we did, and I feel so proud of us. We got through it, we were able to make memories full of love and pride, and got to share Leo with 50 family and friends. I know some may consider the event a far more private affair, but for me, it became the most important thing ever – to have people there. Our stomachs dropped with everyone who was sadly not able to make it, but knowing they wanted to and tried to get there really was a comfort. I needed people there, to know that people cared about Leo, that he mattered, that he was real. One final touch was something inspired by our SANDS memory box. We gave everyone a small tea light in a bag, with a small card picture of Leo. 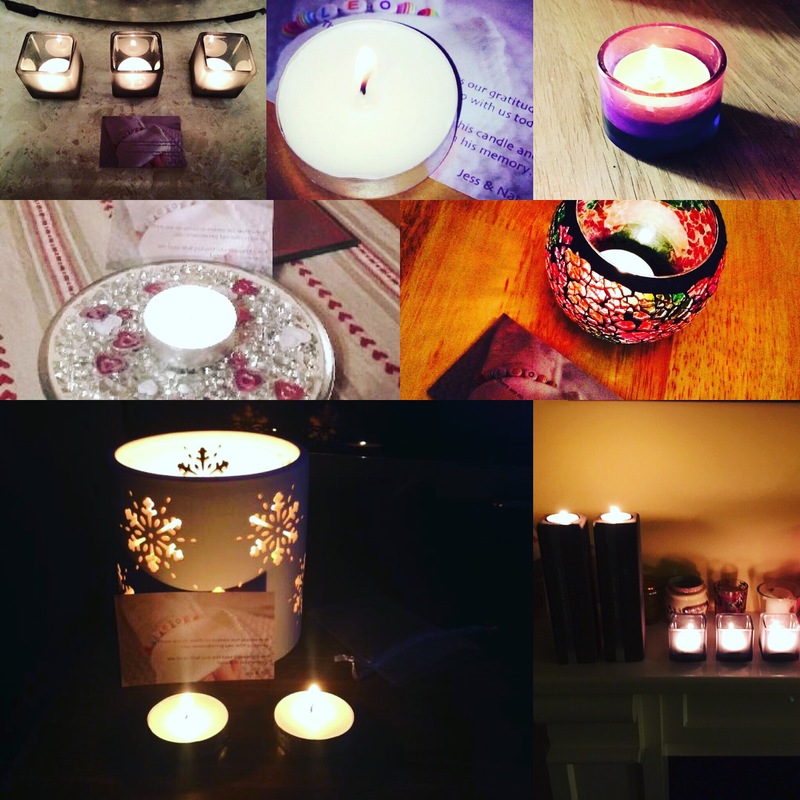 We asked people to take Leo into their homes and light a candle for him. Something we have been doing, which is very comforting. It is so nice to think that people welcomed Leo in to their living rooms and spent a few moments thinking about him. I’m so sorry you’ve had to go through this but glad the funeral went as well as it could and it was on your terms and blended with your lives and history. It’s good that you’ve written about it all now as a record before the haze of memory blurs details about the day. I’d love to share your post with my Twitter followers but with something so nakedly personal I’ll ask permission first. Thank you so much for sharing your most precious memories and the journey you had to take before you were able lay your lovely boy to rest. What a wonderful act of generosity you have given to all of us and very particularly to other parents having to face the unimaginable sadness of arranging their child’s funeral. Thank you & love to you both & your family. Many thanks for your kind and humbling words Helen. If it can help just one person, then I feel sharing it was worthwhile. I completely resonate with this. Thanks for putting it in words. Leo’s day with you and your family sounds like it was really great. Well done for organising it in such a special way. Thank you 🙂 it was the hardest day but being able to feel we were able to do it how we wanted helps feel at peace with it.